The N1K2-Ja Shiden-Kai is a Rank IV Japanese fighter with a battle rating of 6.0 (AB) and 6.3 (RB/SB). 780 450 ??? ~?? ~? This fighter-bomber version of the N1K2, the N1K2-Ja Model 21Ko, was developed at the time the N1K2-J began production. The main difference between the two planes was the 21Ko's steel underwing pylons. This Shiden-Kai could carry four 250-kg bombs, two under each wing, or two 500-kg bombs, or two or four 60-kg bombs. It could also carry unguided rockets, like the N1K2-J. The N1K2-Ja could be visibly distinguished from its predecessor by the lower position and reduced area of its horizontal fin. 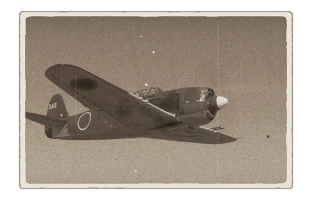 Upon its success in factory testing, the N1K2-J was selected by the Japanese Imperial Navy as its primary fighter and fighter-bomber. The Navy planned to launch large-scale mass production of the Shiden-Kai, but its production was always behind schedule. The aircraft's construction situation became critical when American B-29 Superfortress bombers began attacking Japanese industrial sites. The attacks did not target the production facilities containing the Shiden-Kai assembly lines, but supply companies were attacked, leading to a shortage of sheet metal, forged steel, stamped aluminium, and engine and chassis parts. N1K1-J fighters were first used in battle near Lake Sebu in October 1944, then used en-masse in the Philippines. From the end of 1944 on, the N1K1-J and N1K2-J aircraft were primarily used for the defence of the Japanese homeland. The most famous squadron of Shiden-Kai formed in December 1944. Known as the 343rd Kokutai, it was under the command of the most experienced Japanese naval commander, Minoru Genda. His squadron consisted of Japanese aces, and their planes were all N1K2-Js. This Genda's Blade squadron was known as a squadron of experts, the elite of the Imperial Navy's aviators. The Americans quickly felt their skill in battle. For instance, in February of 1945, Midshipman Kaneyoshi "Kinsuke" Muto, piloting an N1K2-Ja, single-handedly attacked 10 F6F Hellcats, shooting four of them down and forcing the others to retreat. The Shiden-Kai was an extremely unpleasant surprise for the Americans. The original Shiden was good, but this model, free of its predecessor's "childhood illnesses", was superb. It would soon become clear that even a pilot of average skill in a Shiden-Kai could challenge any Allied fighter, even the P-51 Mustang, which began its fight in the skies over Japan in the spring of 1945. Production of the N1K2-J ended after Japan surrendered. In all, 1,435 Shidens of all variants were constructed, including 998 N1K1-Js and 415 N1K2-Js. This page was last edited on 19 March 2019, at 14:58.